We offer four distinct two-bedroom floor plans, all with two full baths and deluxe features. 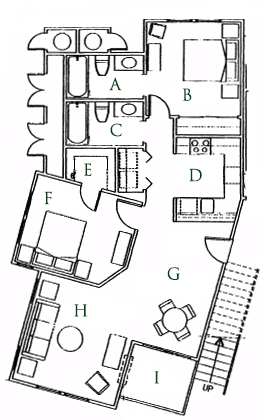 Each floor plan offers its unique advantages – for example, Floor Plan "F" includes a fireplace and extra-large kitchen. Large, U-Shaped Kitchen 8' x 9'4"
Large, Bright Living Room 12'10" x 13'6"
Dining Room 9'6" x 9'6"
Large Balcony/Patio 10'4" x 8'11"
Living Room 13' x 13'6"
Dining Room 10'8" x 11'9"
Living Room with Fireplace 13'9" x 12'2"
Dining Room 9' x 9'9"